When the magnolias bloom, you know it’s summer in South Carolina. Large, creamy-white blossoms like this one grace the often massive trees so common to our landscape. Their distinctive fragrance can, by itself, make any native Southerner think of home. The Southern Magnolia (Magnolia grandiflora) is native to this country and can be found from North Carolina to Florida. It also grows west across the southern border of the US to Texas, and up the west coast all the way to Oregon. A large tree, it reaches 60 to 80 feet in height and 30 to 50 feet in width, typically taking a pyramidal or oval shape. The tops of the evergreen’s leaves are waxy and deep, glossy green. The bottoms are soft and slightly fuzzy – a dull reddish-brown. Its cheery red seeds resemble large kernels of corn. The magnolia is one of the oldest plants on earth, and various varieties grow across the continents. Another name for the Southern Magnolia is Bull Bay. Yes! I can email you a pic. Do you have a photo of the plant? I stayed in a cabin on Hunting Island and was amazed by the beautiful flowers in bloom. 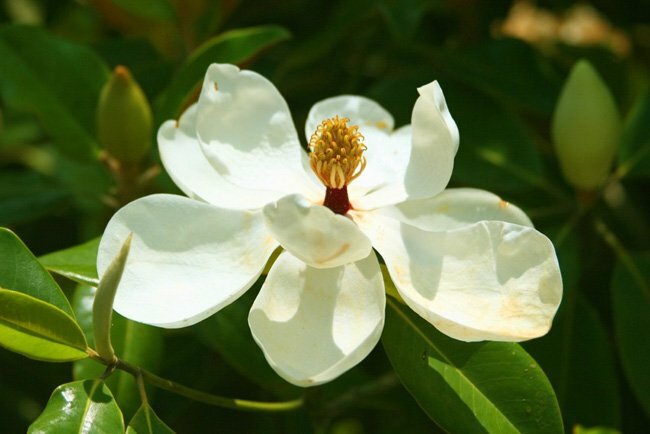 One plant in particular…had the leaves of a magnolia but was low growing, at the base of many trees in the wooded area and at the shoreline. Can you tell me the name? According to Clemson Extension, they can bloom in early spring or summer. What month do Magnolias bloom in Charleston?